New research findings indicate that an early onset of dietary treatment may slow down the progression of Alzheimer's disease. 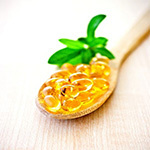 Several epidemiological studies suggest that docosahexaenoic acid (DHA), an omega-3 fatty acid found in fatty fish, might reduce the risk of Alzheimer's disease, News Now wrote. Experimental studies have also observed a positive, although modest, association between DHA and several processes behind Alzheimer's disease. The study used transgenic female mice carrying APP and PS1 mutations linked with familial Alzheimer's disease, and wild-type mice. All the mice began the dietary intervention at five months and continued on the diet until 13 months old. The fat content of the control chow was increased to better correspond to human diets. In addition to the control chow, some of the APP/PS1 mice were fed three experimental chows enriched with fish oil and having a similar fat content as the control chow: fish oil supplement only, plant sterol supplement or Fortasyn supplement, which contains uridine-monophosphate, phospholipids, B- vitamins and antioxidants. As expected, APP/PS1 mice performed significantly poorer than wild-type mice in the Morris swim navigation task, which measures long-term spatial memory. Among transgenic mice on the experimental diets, the mice on the Fortasyn diet performed equally well as the wild-type mice, whereas other dietary treatments showed no improvement. However, all test diets reversed the memory deficit of the APP/PS1 mice in the odour recognition task. The levels of accumulated amyloid-â protein in the brain were examined at the end of the study. A significant reduction in the amyloid-â levels was observed in the plant sterol group while other experimental diets showed no effect. However, why was a substantial reduction in brain amyloid-â levels not accompanied by a positive memory effect in the spatial task in the plant sterol group? One explanation is that the plant sterol diet increased formation of reactive oxygen species in the hippocampus, whereas the Fortasyn diet, which yielded the best results in the spatial memory task, tended to have an opposite effect. The results indicate that even slight changes in the composition of the diet may, under a sufficiently long period of time and at an early stage of the disease process, lead to significant changes in brain metabolism and improved memory performance.